Made from an ultra-flexible woven raffia, the Alpargatas has a bucket crown that perches slightly higher on the head than most hats do. 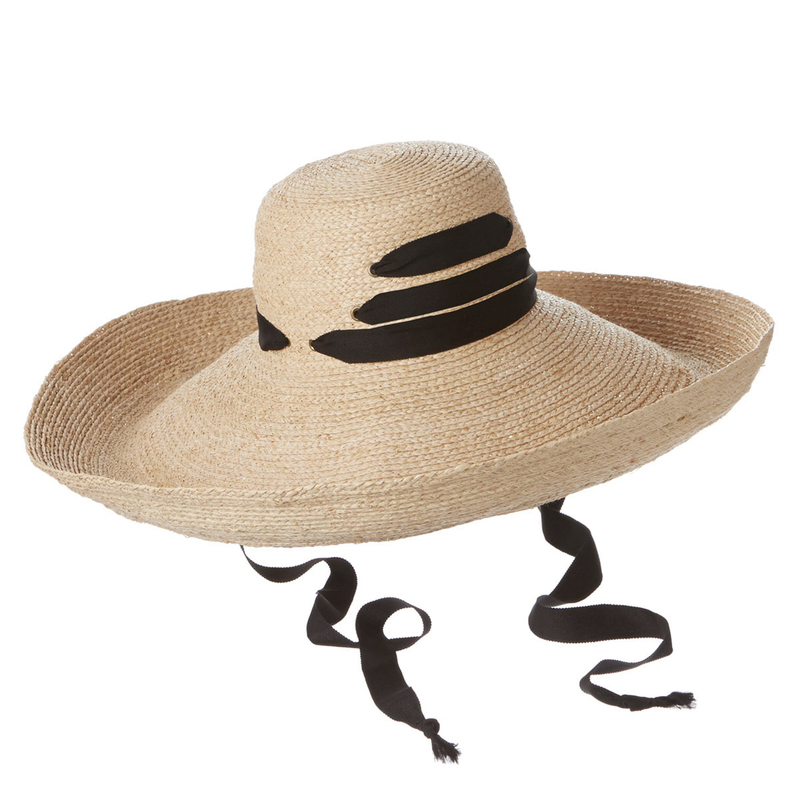 The brim is top-stitched and finished with a fringed edge that suggests endless sunny days spent beneath the shade of a palapa. 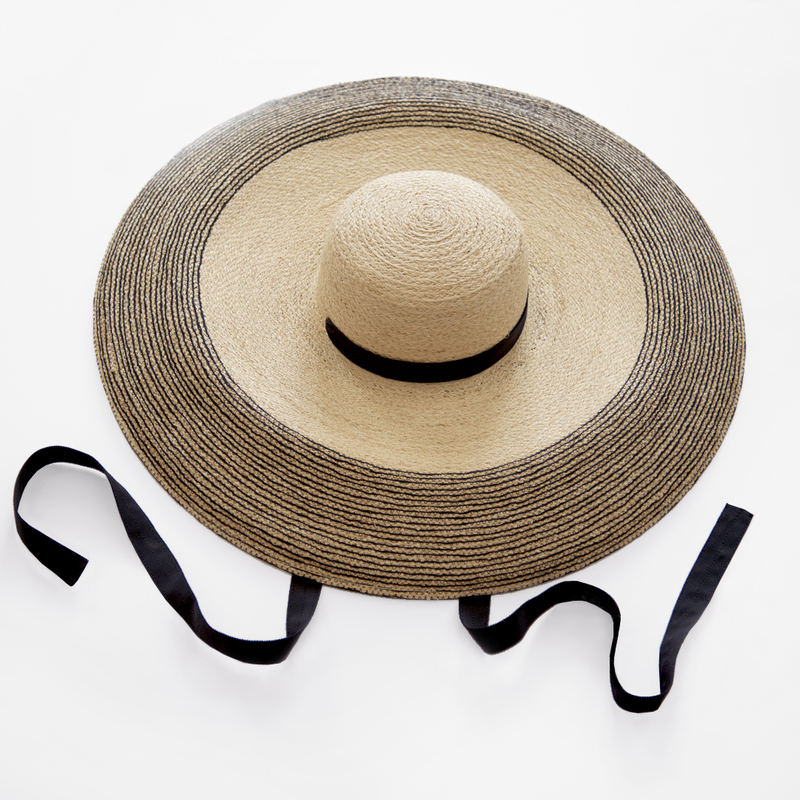 A long grosgrain ribbon is threaded through eyelets to serve as a chin tie. Knot it saucily beneath your left ear, or just let the hat hang nonchalantly down your back as you stroll from beach, to market, to festival. Solid & Striped is swimwear and après swim made from the finest globally sourced fabrics. Effortless essentials for the leisurely life, Solid & Striped is guided by a desire for everlasting holidays and classic style and is designed to be worn, lived in, and wholeheartedly embraces spontaneity. The Kiersten suit offers slimming color-blocked panels and seams with full coverage for maximum movement on land or at sea. It’s a modern solution for sports of all sorts. Note: The Kiersten is running at least a size smaller than our other Solid & Striped suits. Swimwear sales are final and we’re unable to accept returns. Please peek at the size chart for proper fit! The Nomad makes every entrance—and exit—doubly dramatic, yet it’s remarkably wearable! It’s cleverly crafted from a narrow raffia tape that’s zigzagged edge-to-edge for ultra flexibility. A cotton thread is woven between the stitches to create a 5 ½” wide accent along the brim. 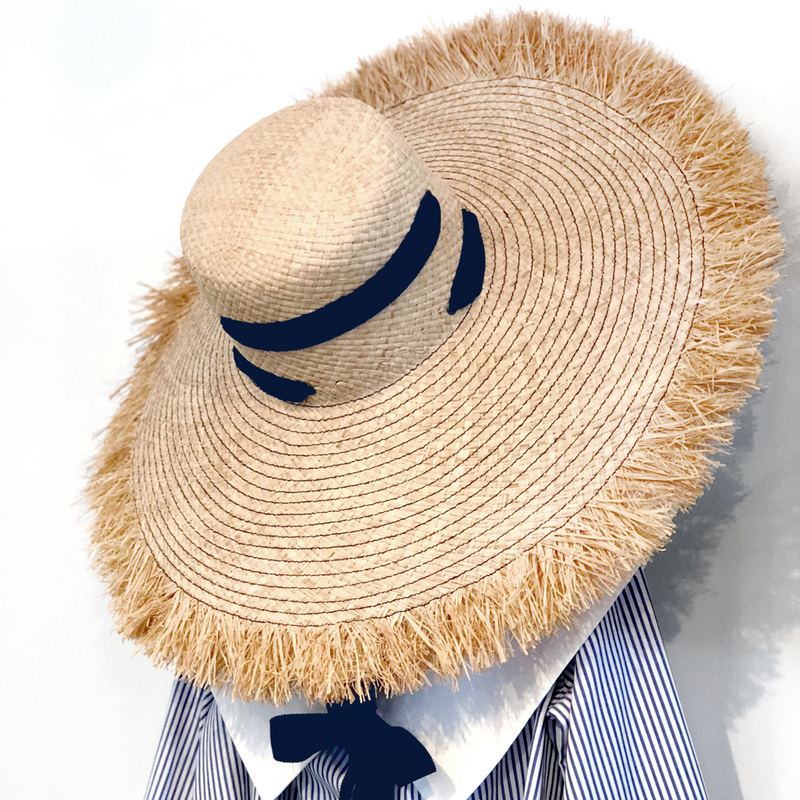 The deep, back-dipping brim provides plenty of shade to neck and shoulders, and the hat so flexible you can actually wear it while reclining on the sand with your favorite beach read and frosty beverage. The Lucy is a flattering scoop neck tank that swoops at the sides and finishes with a flourish in back. Adjustable straps can be tailored to your torso length so they stay put whether you’re jack-knifing from the high dive, or cannonballing from the dock. This stunning suit dips to a low V in front and is cut high at the hip —perfect when sunbathing is the order of the day. Faux double-breasted with buttons that march down the front in twin rows offer twice the charm. Choose black/cream or navy/cream. 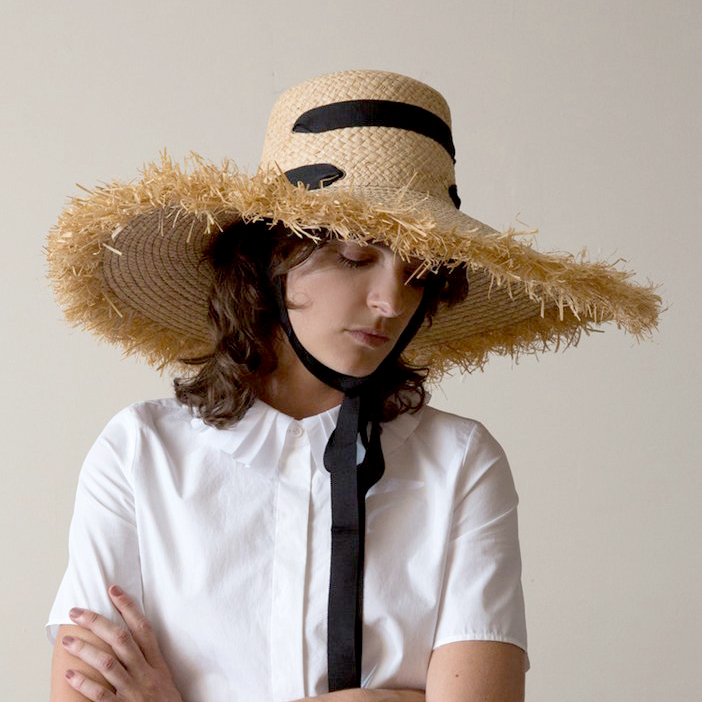 Elevate even the simplest of sundresses simply by adding our amazing Espartina hat. 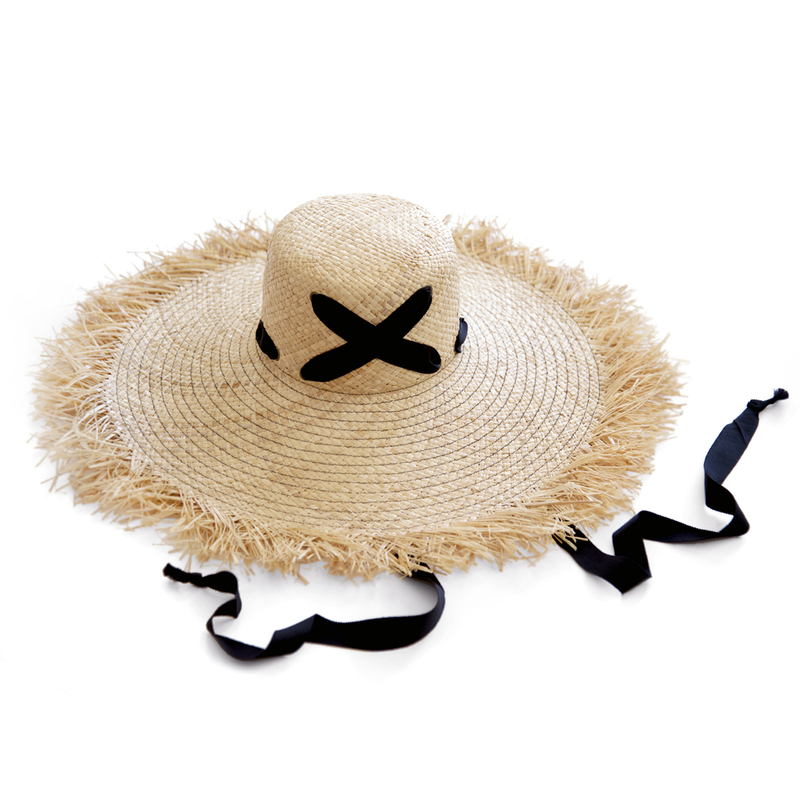 Handmade from creamy beige raffia, the molded crown rides slightly higher on the head carving out a memorable silhouette, while the wide brim coolly shades you from the sun and the prying eyes of the paparazzi. Black grosgrain ribbon can be laced through the triple row of eyelets and knotted jauntily under the chin or left to dangle all devil-may-care as an exclamation point on both sides of your face. This stunning suit dips to a low V in front and is cut high at the hip —perfect when sunbathing is the order of the day. Faux double-breasted with buttons that march down the front in twin rows offer twice the charm. Choose navy/cream or black/cream.